AHMCT researchers have developed a deployable prototype system for bridge profile sensing from a vehicle at highway speed, i.e. with no fixed or rolling closure. The system uses a scanning laser to measure range and reflected power from the bridge and the roadway. The laser data is analyzed by custom software to determine bridge height measurements, as well as lane widths and other horizontal dimensions. The software includes a user interface for interactive fine-tuning of the results. These dimensions can then be used to update a two-dimensional profile of the bridge and the corresponding databases in support of oversize vehicle permit generation. The tool facilitates producing standard Caltrans clearance diagrams from the extracted dimensions. Accurate bridge-height clearance information for oversize route planning is critically important to the Nation’s economy. Collecting this data can be dangerous or can cause congestion. The current system allows highway-speed sensing of two-dimensional bridge profiles from a moving vehicle, and subsequent data analysis and extraction to support maintaining these vital database and permit systems. AHMCT researchers have developed an architecture and prototype system to determine bridge structure two-dimensional profiles for use in oversize permit generation and routing. The system is based on a vehicle-mounted scanning laser range-finder. Reflected range and power measurements support post-processing by custom software to identify key features, and allow estimation of bridge height over each lane stripe, as well as horizontal clearance information including lane and road widths. The sensing can be done at highway speed, i.e. with no fixed or rolling closure. The structure and roadway elements are sensed entirely from within the moving vehicle, so that workers are not exposed to high-speed traffic. The scanning laser (block diagram and hardware shown in Fig. 1, laser detail in Fig. 2), with no vehicle motion, provides a two-dimensional slice of range and reflected power. The vehicle provides the forward motion, resulting in a helical scan of the bridge structure. 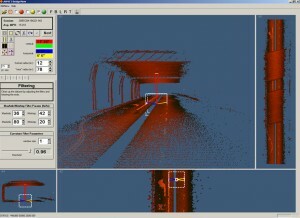 The collected data provides a detailed 3-D world model of the bridge underdeck and the surrounding roadway. A digital still camera acquires a coordinated image of the overall bridge profile for future identification and verification purposes. The entire sensing operation is coordinated with the vehicle speed, and acquisition can be manually triggered by the operator, or coordinated with GPS/GIS, given reliable GIS data. Custom software post-processes the collected data, and identifies key features. The process begins with a variety of filtering operations to reduce noise while exploiting known properties of bridges and roadways. 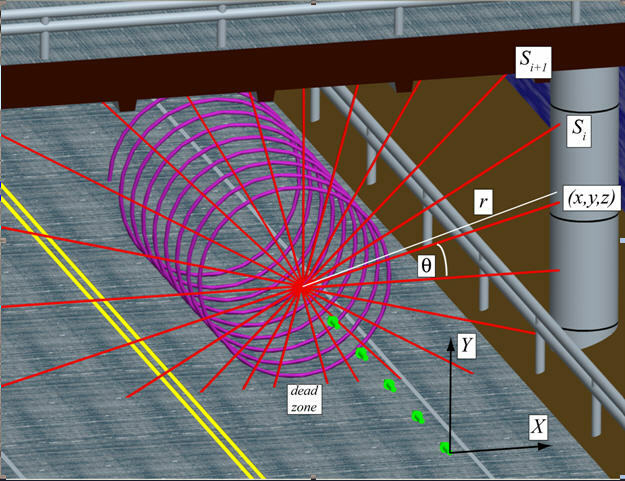 The helical scan data is converted into Cartesian coordinates, yielding a full 3-D point model of the bridge underdeck and surrounding roadway. This model can later be used for visualization and other applications, in addition to the profiling operation. The program identifies key lane boundaries and road edges and curbs—critical of course for horizontal dimensions, but also essential as federal standards mandate that bridge heights shall be measured above lane boundaries. From these identified features, the software then estimates the clearance heights above each lane stripe, and also provides the horizontal dimensions for lane widths, distance to curbs, distance to bents, etc. This information gives a full two-dimensional profile of the bridge. The software allows for interactive operation so that human perception, experience, and intelligence can improve the overall results. The interface helps the analyst to iterate on feature identification and measurement operations until the results reflect the best combination of automatic sensing and processing mixed with human strengths. The results of the automatic and human interactive feature and dimension identification are then output in a standard format based on current DOT practices. For example, the results can be output in a standard two-dimensional profile drawing, matching the output provided by current structural inspections. As such, the format is well-matched with current practices, and will require no organizational changes or re-training. However, as the data is available digitally, it can support other output modes, as well as direct computer interaction with other systems. With full confidence in the system and human interaction at the stage of feature identification and dimension extraction, it is conceivable to provide automatic update of the relevant databases. The software facilitates generation of the clearance diagram generation from the feature and dimension identification. The prototype system was field-tested by Caltrans Structures Maintenance from early 2005 through 2007—test results were generally positive. System and research project documentation is in progress. Areas for improvement with respect to asphalt pavement have been identified, and AHMCT has suggested approaches to address these issues. 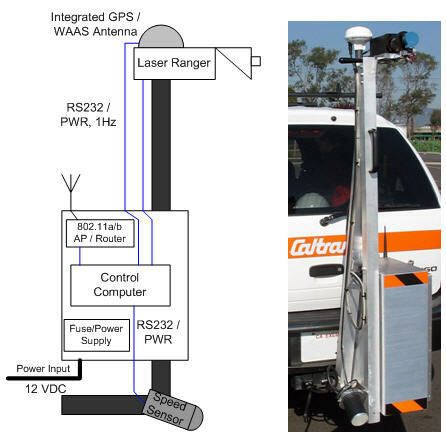 In addition, Caltrans and AHMCT are actively investigating newly-emerging commercial systems that apply state-of-the-art mobile laser scanning for bridge profile sensing; a particularly promising commercial system is available from Mandli Communications. Under related research, AHMCT is investigating a variety of mobile laser scanning systems for a broad range of Caltrans applications, including highway-speed pavement scanning and roadside asset scanning, recognition, and management. 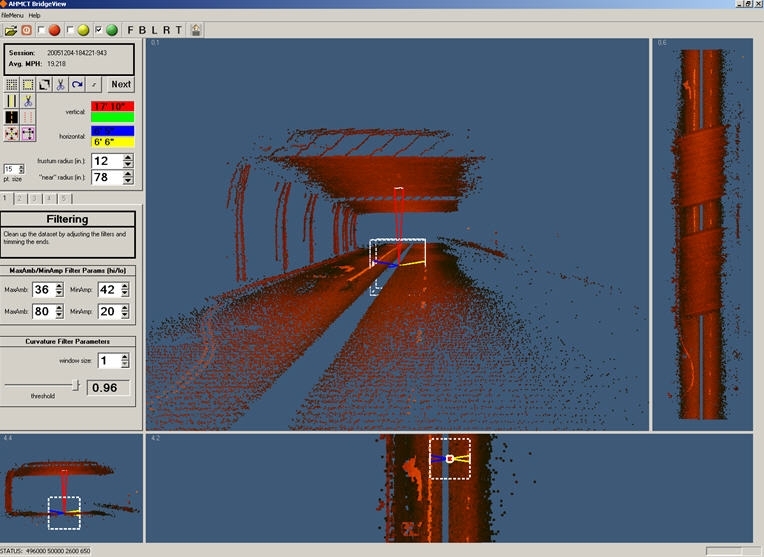 Based on our research results as well as the new commercial systems, deployment of highway-speed bridge profile measurement combined with a user interface to support interactive feature identification and measurement validation will greatly enhance the accuracy, safety and efficiency of structure profile measurements, and will strongly benefit oversize permit generation and routing operations.